Recently, I've been reading in trade publications and in online discussions about the 'exciting' new category of bikes known as Gravel Bikes. This is more than a little amusing - and a clear example trying to market an old idea with new bafflegab. We used to call this type of bike our winter bike, the one you would outfit with older components, wider tires and mudguards (if you were smart). You would ride it in inclement weather, sloppy road conditions or, if you lived out in the country where some of the concession roads were gravel or dirt, on routes that didn't have great pavement. For a while, the concept of a winter or 'beater' bike disappeared; there became an obsession with always riding your latest, coolest stuff. Now, ironically, it appears that the beater bike is in - maybe it is the start of the Grunge Period for cycling fashionistas? Leaving aside the trendoids, it makes sense to have a bike that you can ride in less than perfect conditions - some of my favourite rides have been on backroads that I certainly wouldn't want to take a bike with ultra-skinny tires and twitchy handling on. 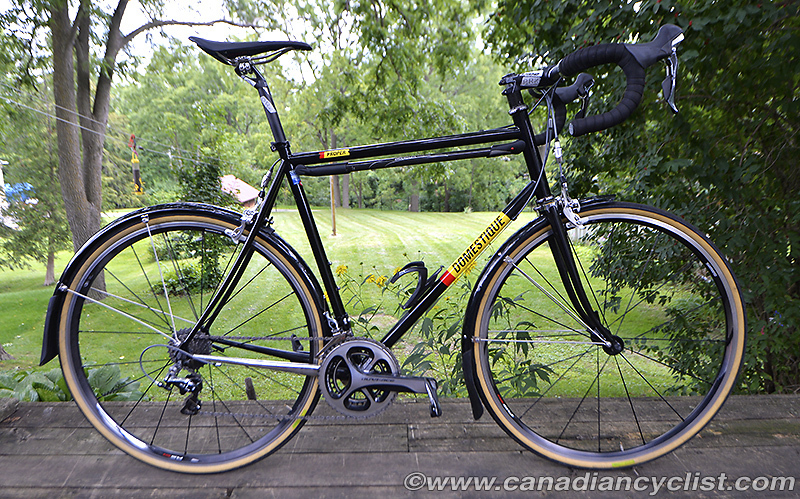 Krys Hines at Café Domestique in Dundas, Ontario, certainly believes in that philosophy, and he has created the platform for such a bike with the introduction of his Domestique Proper. 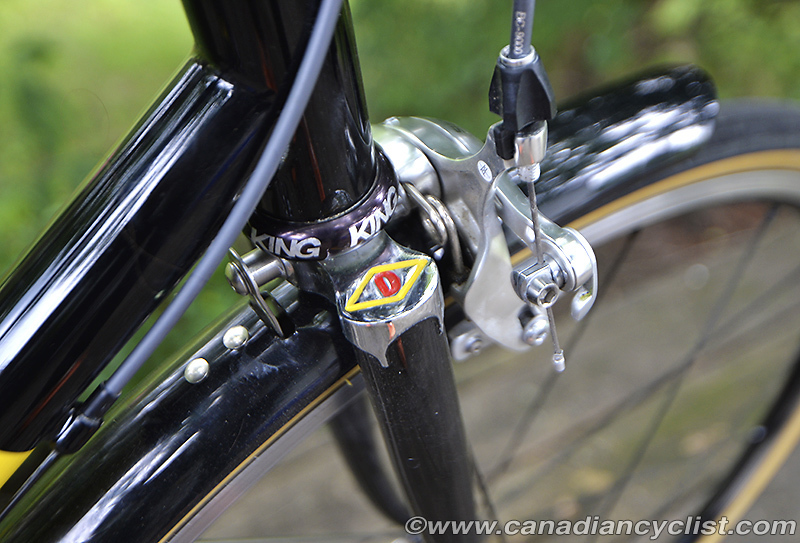 The name, by the way, comes courtesy of pro mechanic and occasional CC reviewer Chad Grochowina of the Dundas Speed Shop, who said "Now that's a proper bike". Working with Marinoni Cycles out of Montreal, Hines has designed a steel road frame and fork combo that is a perfect base upon which to build up your own go anywhere bike at a reasonable cost. 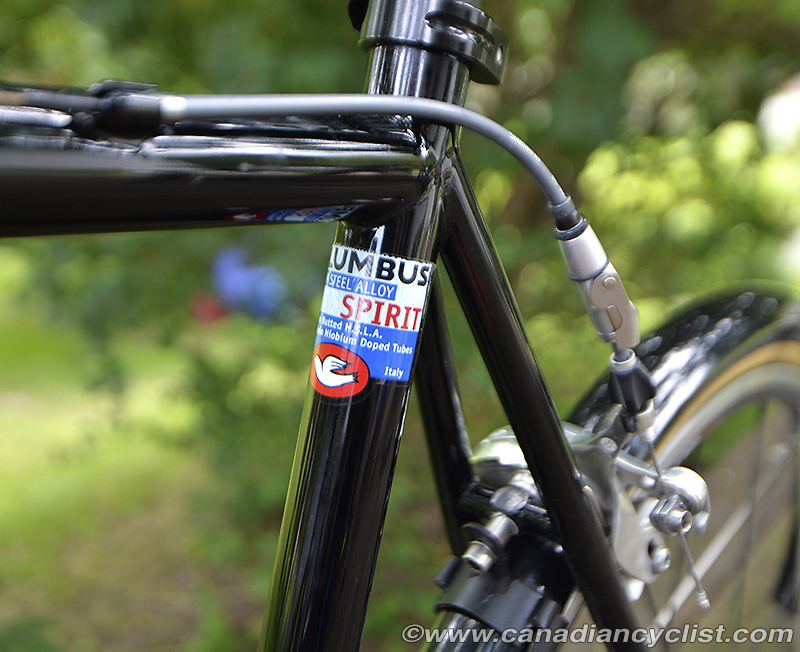 It uses a combination of Columbus Spirit and Zona tubing (the exact mix varies by frame size), accepts either mechanical or electronic shifters, regular caliper brakes (57mm reach), and comes with a clean, Nervex-style flat crown steel fork. It accepts a standard English thread bottom bracket and a 1/1/8" Aheadset-style headset. Eyelets are brazed on for mudguards (a rack braze-on is optional), as are two water bottle mounts, a pump peg (under the top tube) and a chain hanger on the right seat stay. 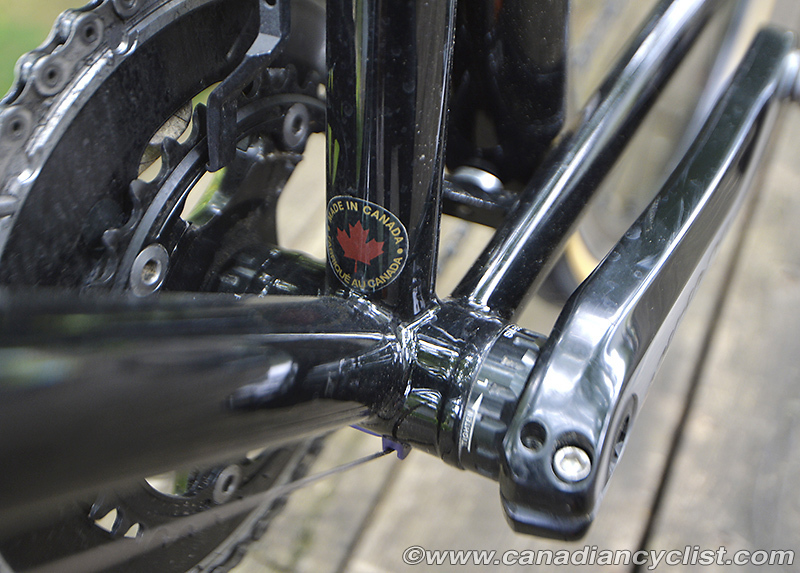 The front derailleur is not a braze-on. Sizing is in 2.5 centimetre increments from 47 to 57 cm, plus a 60 cm model for us bigger folks, with a semi-sloping top tube. It comes stock in one solid colour - pretty much anything you want from Marinoni's colour selection. The frameset price is a very reasonable $1200 (custom sizing is available for a $150 up charge), with delivery running about six weeks. The bike geometry is more laid back than the current style, but nothing too radical. The clearances may look enormous for those used to the current ultra-tight, no room for a credit card, designs, but it leaves room for the aforementioned mudguards and wider tires more suitable for rougher road conditions. You can either get the Proper as a frame and fork and build it up with your own hodge-podge of equipment, or Krys can organize a complete bike with whatever componentry your heart desires. Personally, I look at the Proper as an opportunity to make your own personal style statement, rather than an off the rack Shimano or SRAM build. Fork trail and chainstay lengths are greater than current geometries, and head angles slightly slacker. This results in a smooth ride without twitchy steering that would be annoying on rougher roads. I purposely avoided saying slower steering, because it isn't slow steering. On smooth pavement the bike tracks just fine and cuts through corners without concern at any speed. However, on less optimal surfaces it continues to track well, without the heart-stopping washouts and constant demand for attention that more highly strung bikes require. 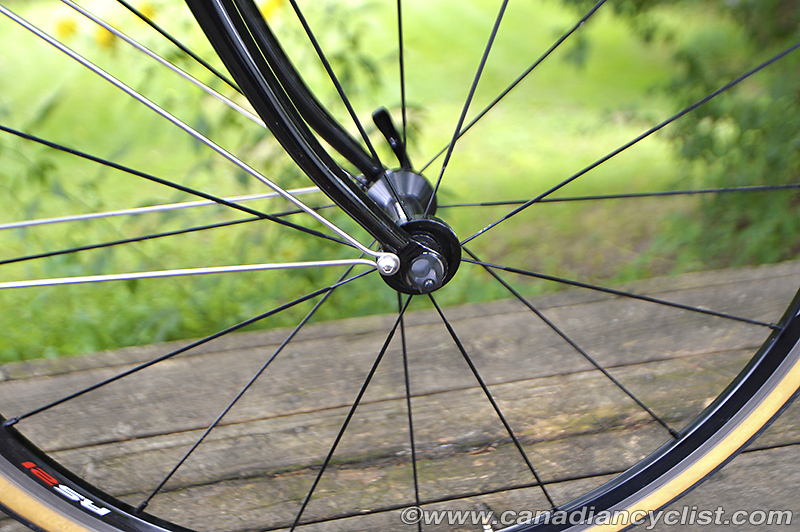 You could easily throw a set of light weight wheels on a Proper and take it on a fast, sign sprinting group ride. But you could also stick mudguards and heavier duty 32c tires on it and have a great ride on those gravel roads you always avoid, the quiet ones through the countryside where the cars are few and far between. This could be the perfect excuse to use up that pile of parts gathering dust in the basement, and extend both your riding season and routes. 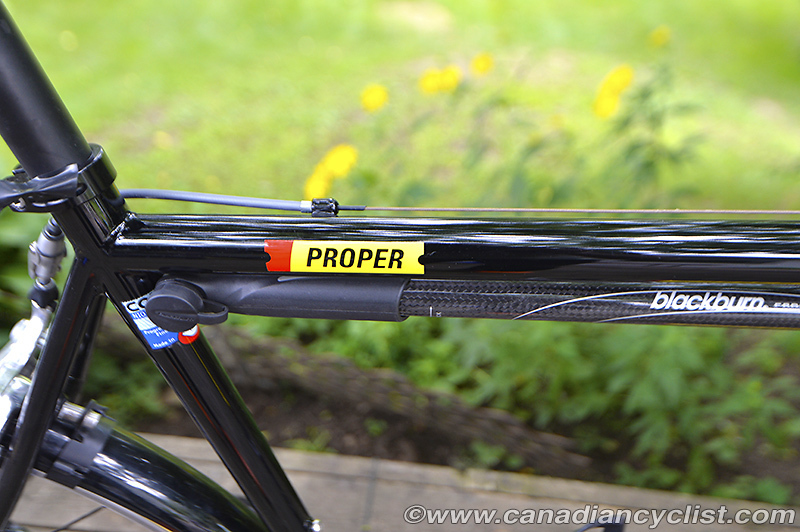 For more information on the Domestique Proper, contact krys@cafedomestique.com or (416) 505-5342.